Earth and neutral wires have been reversed. This will still work but is not correct & there is a possible danger to the user. Live and neutral wires have been reversed. There is a danger to the user as the switched live will be non-existent. The earth screw is missing meaning the earth is non-existent, which is a danger to the user. Used a 13 amp plug as a extension connector with live pins exposed under the desk! Disconnected switch from ice cream machine also disconnected earth & trapped live wire in casing. Fitted extension socket on bench with 2 core flex, so no earth was connected. Caretaker had used 2 core lawnmower flex for 4 extension leads so no earth present. This meant that any appliance connected to these and would have had no earth protection. This could have been fatal if the appliance had become faulty. 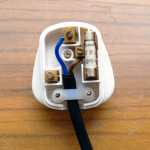 No extension lead should be fitted with 2 core flex! 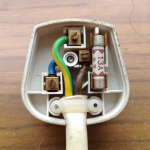 Some people try to cut corners & save money by replacing flex & plugs but do not know how to wire a plug correctly, we have seen reversed connections live & neutral, even seen blue neutral wire connected to earth pin. 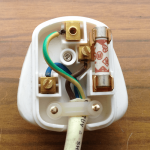 Plugs without flex holder connected which means that the flex will pull out of the plug exposing the inner core. Broken plugs held together with tape. Taped joints on any flex is a fail although it can be repaired with connectors & heat shrink covering. 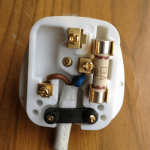 Fridges/freezers with very low insulation reading so a fail, but discovered after investigation that it was the moulded plug that was fitted when new that was causing the problem. Replaced plug & passed ok.
Two core flex & even bell wire fitted to lamps with brass fittings which all require 3 core for earth.